I’ve been hearing about Bronto Skylift for a wee while now, but prior to Friday’s instore gig at Avalnce in Glasgow had never managed to catch them play live. I was more than a little surprised to learn there’s only two of them. Had I actually paid attention I’d have known this already of course, but I didn’t. The make a hell of a lot of noise for a band comprising a singing guitar player and a drummer. A hell of a lot of noise. An instore gig isn’t an ideal place to judge a band, but on Friday’s evidence I’m totally sold on Bronto Skylift. 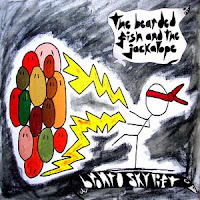 It isn’t that gig that I’m reviewing here though, I’m talking about the reason for it, the release of The Bearded Fish and the Jackalope EP. Short version of the review – 4 tracks, five quid, worth every penny. Also has really pretty art. Still here for the longer version of the review? Fantastic! Thanks for sticking around. After starting off gently for all of around 22 seconds everything kicks off on Lioness, the first track. As soon as the guitar rips in at the 0.22 mark it’s best just to hold on and go with it, because that guitar part has no intentions of letting go. There’s some fantastic drumming going on there too. If Lioness was rough, second track Tiger is like being dragged up an alley and beaten, but secretly loving every second of it. Loud, raucous and brilliant. Hekla, the third track on offer, keeps up the noise levels at first, but changes things up a bit. As the longest song on the EP it takes the chance to offer some breathing space from unrelenting Bront Force Trauma by pulling out the old loud bit, quieter bit, LOUD BIT trick. When done well, I always love that. It’s done well here. Cobblepot is the only song on the EP I had any familiarity with previously, and it is my favourite of the four tracks. Everything just clicks. That boot up the arse riff, the almost Jazz drumming and the pure bloody energy. It very nearly made me dance in my chair when listening to it again for this review. The first 3 tracks are good, Cobblepot is really good. What does it is score on the arbitrary and meaningless star system, I hear you fail to ask? Well, it’s would only be a four out of five stars release, the reason being that it doesn’t quite live up to the full fury of the band firing on all cylinders in a live setting. It comes really bloody close though. However, Cobblepot is good enough to nudge the EP over that extra hypothetical and meaningless star. Five Stars it is then. No songs from the EP, go buy it. You can have Cobblepot, which appears on the EP, recorded live at The Mill though. You can get hold of the EP here, at gigs and in the likes of Avalanche. It comes with a free sticker and everything. Try to pick up Bronto’s first single too, it’s also fantastic. Do yourself a favour though, see this band live. Head over to MySpace to sample songs, get gig dates and all the usual MySpacey type stuff. Oh, and yet again, massive thanks go to Glasgow Podcart for introducing me to the band in the first place. If you aren’t checking out the Podcart yet you are really missing out. One day I’ll get round to a full post kissing Ally Sean and Halina’s collective arses, but for now I’ll stick with thanking them, again, and encouraging everyone with ears to listen to them. Not sure if I can make the gig on Wednesday as I’m going to Hampden, and it’s a right royal pain in the arse getting into town after the game. Are you planning on showing your face?